Six parties failed to submit any accounts at all. 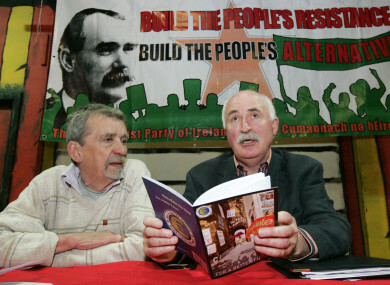 The Communist Party of Ireland was unable to get its accounts publicly audited due to limited resources. NINE OF IRELAND’S 20 political parties failed to comply with legislation that says they must submit audited statements of accounts to the Standards in Public Office Commission (SIPO). Under the electoral act political parties must disclose their accounts to the commission which is tasked with overseeing the ethics of those who hold public office. In its 2016 report on political parties’ statements of accounts SIPO revealed that there was a total of 20 political parties on the Register of Political Parties for the year. Three parties were found to be non-compliant while another six had not furnished any accounts at all. The Communist Party of Ireland, Direct Democracy Ireland and the Workers & Unemployed Action Group, which is chaired by Tipperary South TD Séamus Healy, all submitted some statement of accounts to SIPO but they were found not to be compliant because the accounts were not audited. The commission has the power to appoint a public auditor to examine the parties’ books however it decided against doing so in these cases because none of the parties received any funding from the exchequer. Of the six parties who did not submit any paperwork at all one no longer exists, one made no financial transactions in the year and two (Fís Nua and Identity Ireland) do not have bank accounts. In the report SIPO expressed the view that smaller parties, particularly those that receive no funding from the exchequer, should be exempt from furnishing audited statements. The Standards Commission agrees that the requirement to furnish statements should remain, but that it is unnecessary in these circumstances for the statements to be audited. SIPO made the same recommendation in its 2015 report. The commission published its annual report in July. That report revealed that SIPO sent 66 files to the gardaí concerning possible offences relating to the general election in 2016. Email “Nearly half of Ireland's political parties failed to submit accounts to watchdog”. Feedback on “Nearly half of Ireland's political parties failed to submit accounts to watchdog”.